"Saturn return" A female in touch with a crystal looks into the structure of a well that gets narrower with increasing depth. The bottom reveals two fish entangled, symbolizing an emotional relationship. 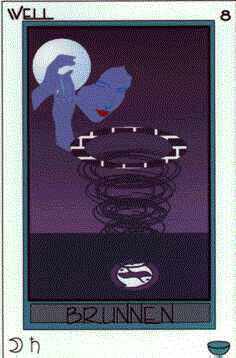 Moon/Saturn: Controlled emotion, emotional pattern. Theme for contemplation: Relationship Affirmation: "I will see you with new eyes" Hint: Got stuck? Insecure to proceed in the right direction? Fear to be abandoned, to be locked in? Allow new depth or let it go. 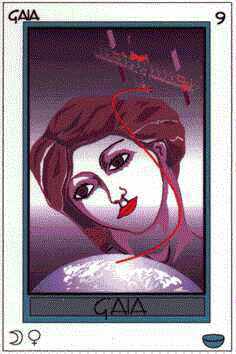 "The world is my oyster" A woman looks tenderly onto our home planet earth. A space station, symbolizing offspring, new frontiers, growth, is connected to the planet's pole by an S-shaped umbilical cord. The universal mother and her children and grandchildren. Happy, supportive family in the broadest sense. Enjoying the safety of a loving family. Moon/Venus: Loving, caring feeling, motherhood. Theme for contemplation: Environment Affirmation: "I am part of the whole" Hint: Enjoy the salty taste of the nectar of the seas. It is your birth right to enjoy each and every breath and feel one with trees and clouds. Intellectual arrogance often hinders this communion. Recognize the intelligence of your heart. "Meditation is the name of the game" Untouched by surface storms rests the vehicle of truth. 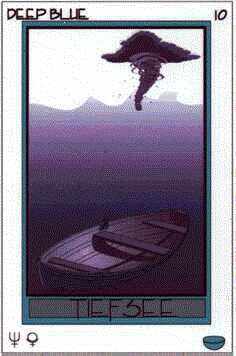 The lifeboat, serenely untouched by turmoil, symbolizes inner resources available at all times if one cares to dive for them. Neptune/Pluto: Revelation, meditation, otherworldly connection. Theme for contemplation: Mahayana, the great vehicle. Affirmation: "AUM" Hint: Watch the rise and fall of your breath. If thoughts come stay watchful, don't "do" anything, let it happen.